Ildikó Allen read Music at Birmingham University and completed her MMus at Trinity College of Music. At TCM, she was awarded the Wilfred Greenhouse Alt Prize in Oratorio for her performance in Haydn’s Nelson Mass under the direction of Sir Charles Mackerras and Second Prize in the TCM Association Soloists’ Competition. She was also a finalist in the London Handel Singing Competition and made her debut at the Wigmore Hall as a Young Artist with the Kings Consort. 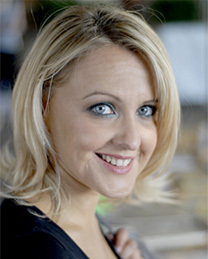 Ildikó’s operatic engagements have included Grilletta in Haydn Lo Speziale for Retrospect Ensemble, creating Cécile in Nicola LeFanu’s Light Passing for BBC Radio 3 at the NCEM, a season with Savoy Opera, Bach St John Passion at Chatelet, Paris with Emmanuelle Haim, Belinda Dido and Aeneas with the Marésienne Consort and Second Witch Dido and Aeneas for the English Country Garden Opera Company. Recent concert engagements have included Bach St Matthew Passion with the Kings Consort broadcast live on Spanish Radio, Buxtehude Membra Jesu Nostri with Retropsect Ensemble at the Wigmore Hall and a recital of Handel Cantatas at the London Handel House. Further concert engagements have included Bach B Minor Mass, Britten Les Illuminations, Carissimi Jephte, Mozart Requiem and Exsultate Jubilate, Handel Dixit Dominus, Messiah, Salve Regina and Silete venti, Haydn Creation and Nelson Mass, Orff Carmina Burana, Poulenc Gloria, Rossini Petite Messe Solenelle, Rutter Requiem and Vivaldi Gloria. Extensive experience in performing contemporary repertoire includes 1st Soprano in Brian Ferneyhough’s Missa Brevis live on Radio 3, the London premiere of Gabriel Jackson Laudate Pueri, Anna Meredith Fly–by–Night with the London Sinfonietta at the Queen Elizabeth Hall, and the performance of new Commissions by Tazul Tajuddin & Jeremy Thurlow for the SPNM at the Spitalfields Festival. Alongside her busy performing career Ildikó also works as a coach and therapist at the Lewis Clinic in Harley Street. She is passionate about helping others to create new perspectives in their lives by rediscovering their innate wellbeing and creative potential.